This is a light and easy supper for two-one of those “bung it all in the roasting pan and put your feet up while it bakes”. 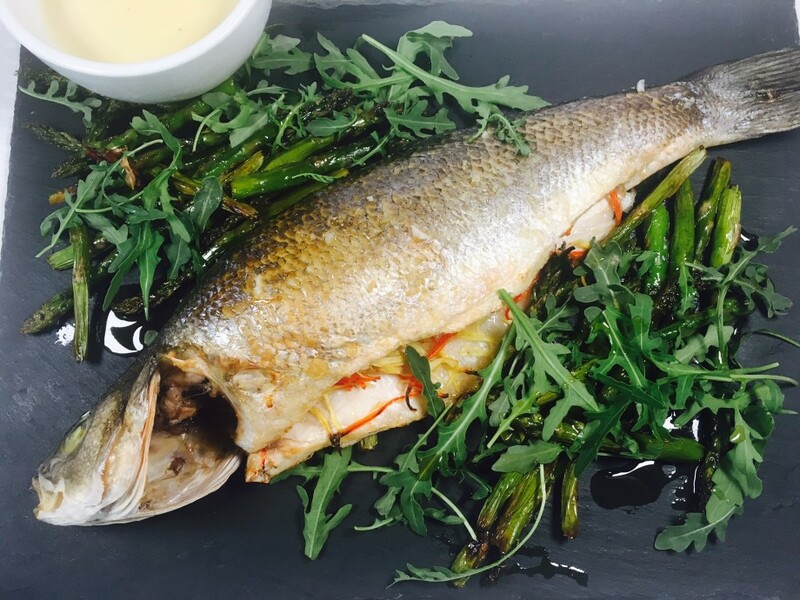 The simplicity of the dish means that a glistening fresh sea bass and some new season British asparagus are key. 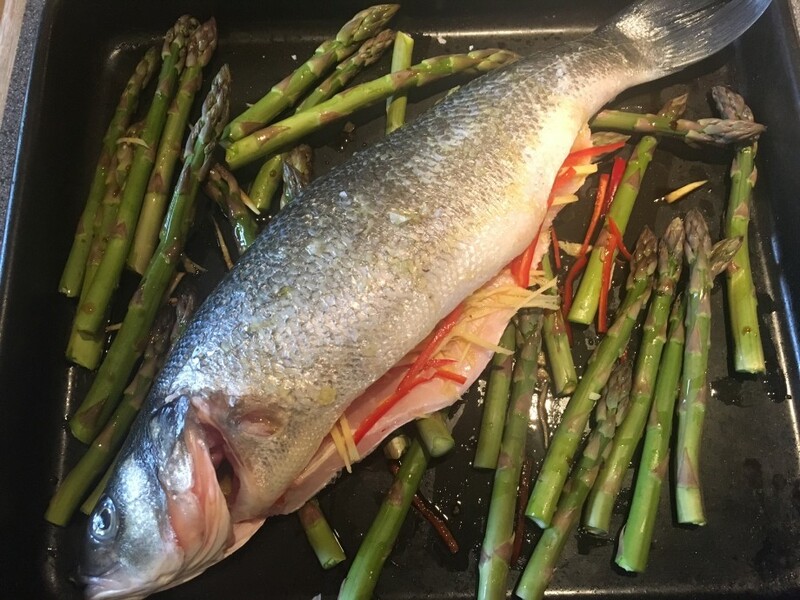 If you can’t source a fish big enough for two you could cook two smaller ones-in which case check after 20 minutes cooking. If the thickest part of each fish feels firm to the touch they will be perfect. I have included a miso mayonnaise to accompany the fish but it is not essential. However, do try it sometime-it is especially good with asparagus. Mix the mayonnaise with the miso paste and chill until ready to serve. Heat the oven to 210˚c, fan oven 190˚c, mark 7. Stuff the cavity of the fish with half the ginger and chilli. Lay the asparagus in a large roasting tin and drizzle over half the olive oil. Scatter over the remaining ginger and chilli. Place the fish over the asparagus and drizzle with the remaining olive oil and the soy sauce. Season with a little salt and ground black pepper. 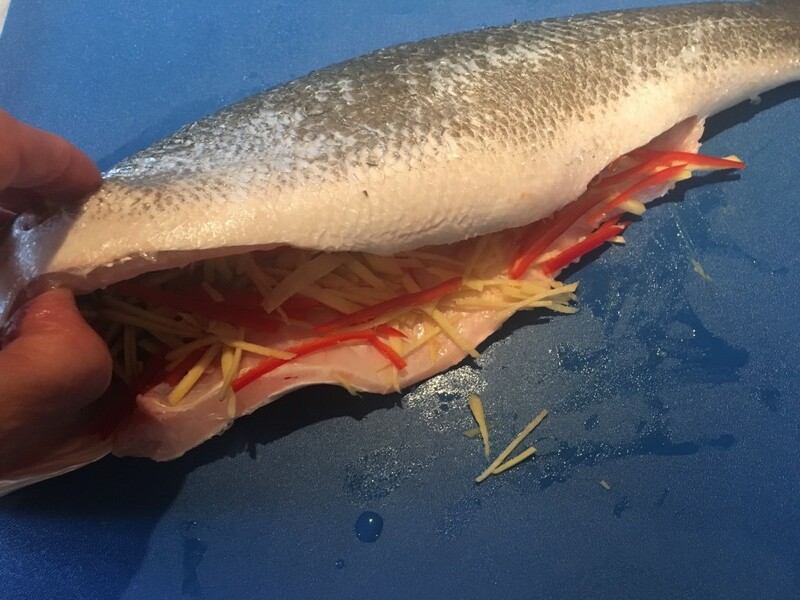 Roast in the oven for 25-30 minutes until the sea bass, at its thickest part, feels firm to the touch. To serve, lift the fish off the asparagus ready to fillet. Transfer the asparagus to a serving dish and scatter the rocket over. Finally, drizzle over a little sesame oil. Serve the filleted sea bass with the vegetables and miso mayonnaise.